The metaphorical chickens are flapping their giant, metaphorical wings and returning home, metaphorically, to their metaphorical roost. I am, of course, talking about the news this week that black carbon pollution from Chinese factories has made its way across the Pacific and now causes ‘at least one extra day of smog each year’ on the US West Coast (according to the Proceedings of the National Academy of Sciences, and reported on The Weather Channel and elsewhere). Those expecting an article on chickens, my apologies: try again next week. The same study also knew where to point the finger: not at China, but the West, because it’s the consumer goods in such demand overseas that causes these emissions. A draft report from the UN Intergovernmental Panel on Climate Change, reported in The Guardian, claims that US and European consumers are ‘increasingly outsourcing their carbon pollution to China’ (among other developing countries). It’s a shared world we inhabit. It’s only so big, and technology is making it even smaller. Actions always have consequences, though not always on the people doing the actions. 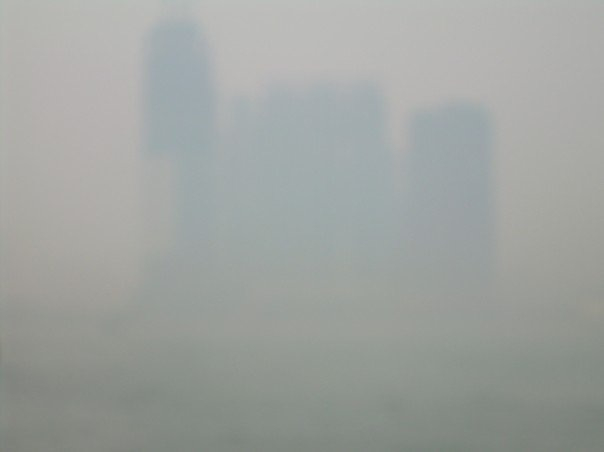 It’s easy for comfortable, remote citizens to turn their noses up at China because of pollution, but we have to be realistic about why the situation is so bad in the first place. And it’s not because of typhoons, barbecues or, indeed, something that should be celebrated because it ‘unifies the Chinese people’ and ‘teaches us a new English word (haze)’. Absolutely amazing! It truly is an old saying that “Everything eventually comes home to roost.” This is the price so many foolish people will inflict upon the world to pay, simply for their own profits. I feel it is poetic justice in a way. Yes, I think everyone needs to realise that we are citizens of a global community and we can’t just outsource the consequences of our decisions and lifestyles. They’ll come back to haunt us, wherever we are! This entry was posted on January 27, 2014 by theguestroom in NewChinaHand.